Not too long ago, I was forlornly searching the travel magazine section at Barnes & Noble for something new and different. I was expecting to find the same old titles, but this time I actually did spy something novel. I spotted the premier issue of Afar magazine. I usually don’t expect too much from a travel magazine. I often find Budget Travel and National Geographic Traveler helpful, but they don’t excite me. And let’s just say I am not the target audience for Travel + Leisure. But I picked up a copy of Afar and took it to the cash register. 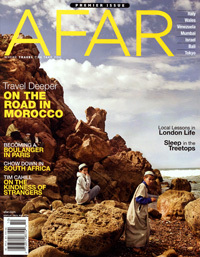 If the first issue is any indication, Afar may become my travel magazine of choice. According to the founder’s letter at the front of the issue, the magazine is not about travel so much as finding meaning in travel. That sounded right up my alley, but a bit lofty to deliver. But deliver it did. The writing was consistently good and many of the topics were new to me. I particularly liked an article about a web programmer who sold his possessions and works while traveling, and Lisa Katayama’s piece about costume play cafes in Tokyo was a great read with wonderful pictures. An article about traveling in Venezuela was fascinating. Reading all the little sidebars is a must, such as “Mark’s Three Great Travel Moments” from the above-mentioned web programmer. There is a lot of great information sprinkled throughout. As far as inspiring my selection of travel destinations, a short piece about the GibbonX tree house lodging in Laos made me want to pick up and head there immediately (except for the part about the leeches). I am scared of heights, but somehow I love the idea of a staying in a tree house accessible only by zip lines. Wheeee! The calendar section listed some unique events taking place all over the world, like Puno Week in Peru and the Sequences: Real-Time Art Festival in Iceland. 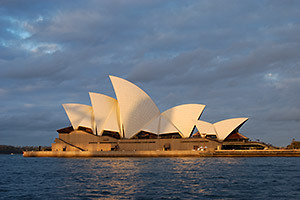 I liked the photography, and would like to see even more full-page photos (maybe even from this wonderful photographer – Stephen Bay) and more photo features like the gallery of shoes. The Feast section was mouth-watering. The closing essay from Tim Cahill, about the kindness of strangers, was a lovely culmination to a delightful reading experience. There is a lot to like about this magazine. Afar says they make a donation to Sustainable Travel’s International Gold Standard portfolio for every issue to offset the carbon emissions generated by flights taken for the magazine. They also encourage readers to recycle the magazine. Does this have an impact? Well, it certainly can’t hurt. The list of things I like about Afar is long. What didn’t I like? Well I didn’t like reading about all these interesting places while I sit behind a desk every day counting the days until my next adventure, but I don’t think I can blame the editors of Afar for that. The first issue is marked Volume 1, Number 1, but nowhere on the cover or spine is there a date. The bottom of each page says “Premier 2009” but for those of us who hang on to our magazines for a long time, it would be nice to see the date on the cover and/or spine. That is my biggest complaint. Really. After enjoying the first issue of Afar, I did something I normally don’t do, and went online and subscribed. They offer a free trial issue, so it is worth checking it out. I think they are still working on the website, but they have a blog that has lots more great travel information to read between issues. Afar comes out six times a year and is $19.95 to subscribe for one year. I highly recommend checking out Jonathan’s blog, Land, Air, and See, as referenced in his comment above. Great reading! Next post: Where did my vacation go?